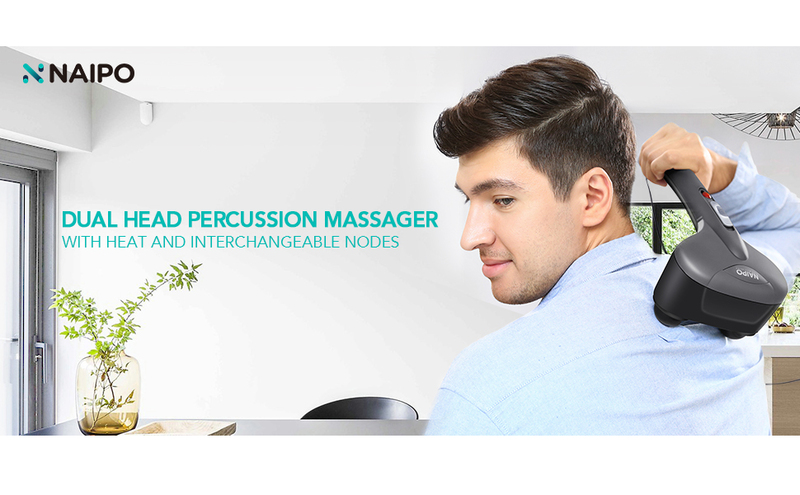 Naipo Percusssion Massager is an affordable ergonomic handheld dual head massager, also called a percussive massager. This light weight and powerful deep tissue dual node percussion massager uses two independently rotating heads and comes with three changeable heads (soft, medium, hard) to provide a therapeutic percussion massage to your sore, tired and aching muscles. handheld massager is well balanced to allow you to reach any part of your body easily without having to contort your arm; so you can massage hard-to-reach areas, like the center of your back, and has a heat setting that warms the heads to warm your muscles as it gives them a therapeutic soft, medium or shiatsu massage. I previously used a different massager purchased at a national chain store. 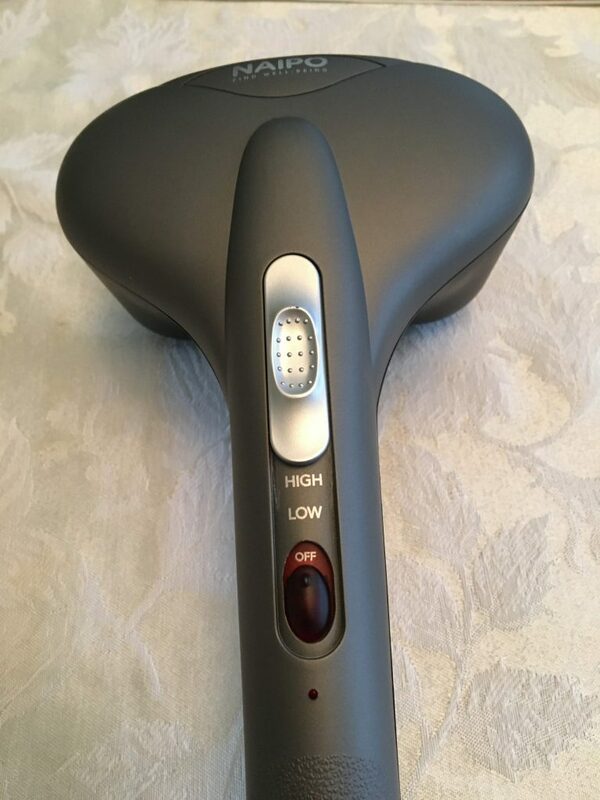 The massage was neither therapeutic or relaxing, so I was a bit skeptical when the company contacted me to try and review the Naipo Massager. I tried the unit, and this percussion massager provided a relaxing therapeutic deep tissue shiatsu massage, that I wasn’t expecting. The soft round heads are great for a basic massage, and the hard pointed heads really get in there for deep tissue shiatsu massage. Why Use Naipo Massage Products? Naipo is a manufacturer of professional grade massage products. Their mission is to provide affordable, comfortable and reliable massage products that utilize the latest modern technologies to promote health and well-being. 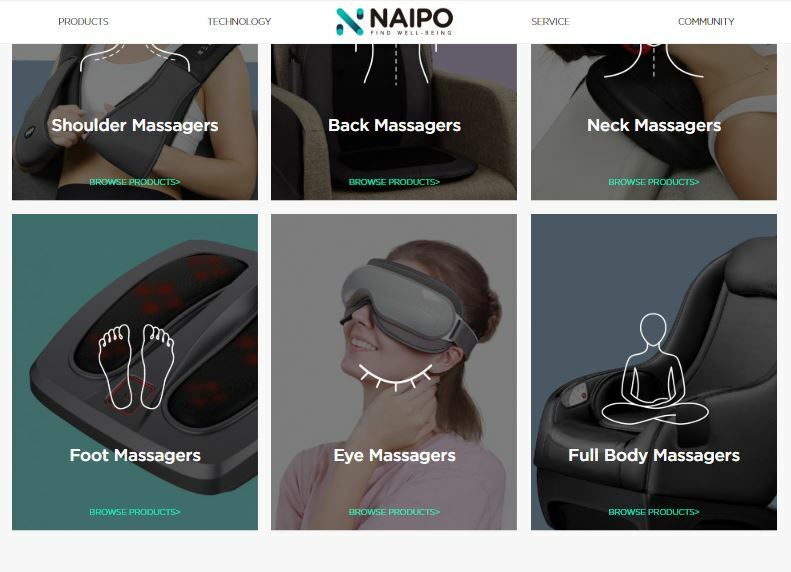 You may not have ever heard of Naipo, but once you use the handheld massager, I am sure you will seek out one of their many other therapeutic and affordable massage devices. They provide a full-line of personal and professional massage devices that provide a therapeutic massage from your head to your toes, and everywhere in between. *The Red heat setting button, which you push up into the On position, warms up the heads to provide a warming deep massage for your tired and aching muscles. The heat setting can be used with either the High or Low setting. Turn on a wait a few minutes for the heating element to warm up the attachments. What Massage Attachment Should You Use? Depending on the type of massage you want, just unscrew (Counter Clockwise) to remove the attachments, and screw on (Clockwise) the ones you want to give the desired massage intensity. Don’t you hate when you have a sore muscle or knot in the middle of your back, and you just can’t contort your hand to reach the middle of your back. How Does a Percussion Massager Work? Naipo Percussion Massager, shoots vibrations deep into the muscles and joints,providing therapeutic massage, which stimulates blood and lymph circulation, thus delivering more oxygen and nutrients deep into the muscle and fascial tissues. This leads to more intense muscle relaxation than provided by a vibration massager, reduces muscle fatigue and soreness, breaks up muscle spasms and alleviates muscle pain. Percussive massage provides a deep therapeutic effect used by therapy technicians, fascial release clinicians and athletic trainers alike, percussive massage delivers a powerful healing impact and effectively alleviates shoulder, neck, and lower back and back pain as well as discomfort in many other areas. Percussion massage expedites the healing and recovery of aching, and sore muscles, offering long-term relief from pain, especially those with chronic pain due to injury, disease or arthritis. In the video below, I have removed the massage attachments, so you can see the hammers in the massage heads underneath moving up and down rapidly to give you a fully therapeutic massage on your neck, back, shoulders or any other place on your body that needs a massage. 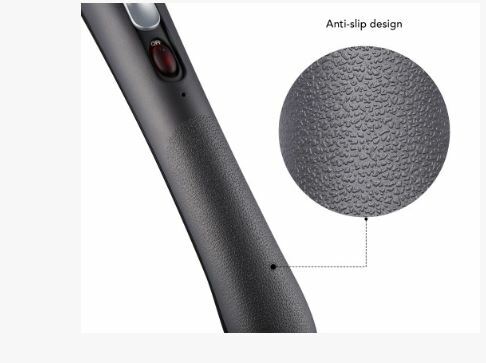 Both sides (grey – top and black bottom) of the handle have an anti-grip section on the handle, to prevent your hand from slipping off the massager. percussive massage uses hammers that send more intense vibrations into the muscle to provide a therapeutic massage. Vibration massage “feels good” while the machine is on, or while you are sitting in the vibrating chair, but once you stop, the pain quickly returns. Percussive massage goes deeper into the tissue to relax sore, tight muscles. You may find percussion massage provides longer relief, and regular use can work out “knots” in your muscles to provide long-term pain relief. The percussion massage action moves rapidly up and down, delivering a pulsing massage action up to 3,400 times per minute, which offers you an intensely relaxing experience whether at home, at the doctor’s office or at work. 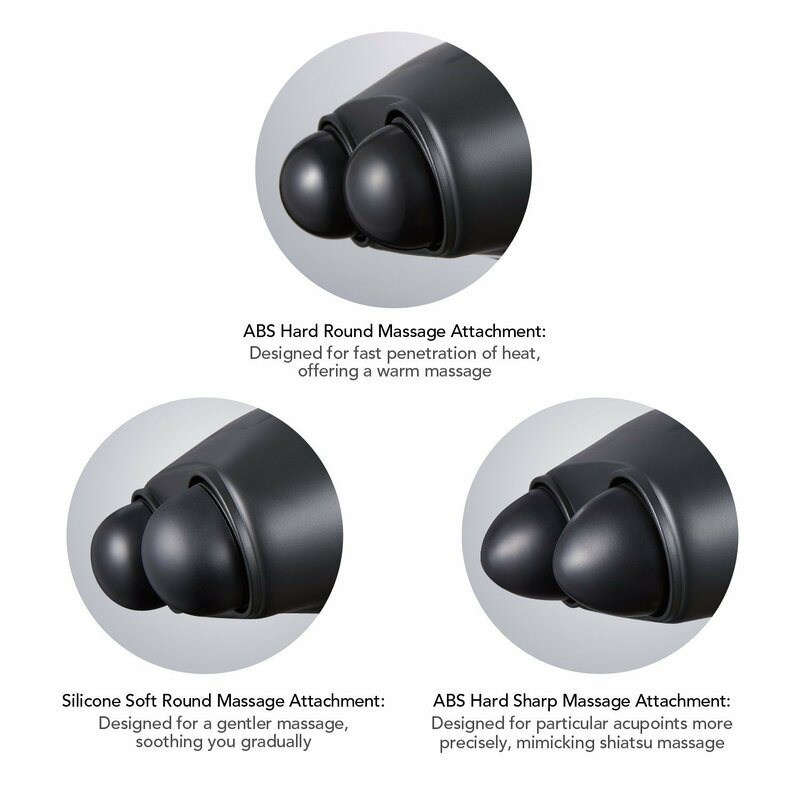 Choose from three custom massage heads, which can easily be changed in a matter of seconds, for a firm, gentle, or soothing heat massage, to target different body parts and acupuncture points such as neck, back, shoulder, arm,leg, thigh, foot etc. Now you can quickly melt away any pain or tension in a few minutes. Improves sleep, as the therapeutic massage can relieve muscle stiffness. Percussion massage improves blood flow to muscle and tissue, thus improving mobility in those with sore, tired and aching muscles. Vibration is basically a shaking motion. A vibrating massage device can be used to create a vibration action for a tingling sensation causing muscle contraction. Vibration massage affects the top layer of skin a muscle for a relaxing, but temporary relief. Percussion massage penetrates deeper within the skin and muscle, than vibration massagers. Like a hammer, percussive massage uses strikes and thumps, which stimulates skin, bone, muscle, veins, arteries, and nerves for a more therapeutic and relaxing massage. 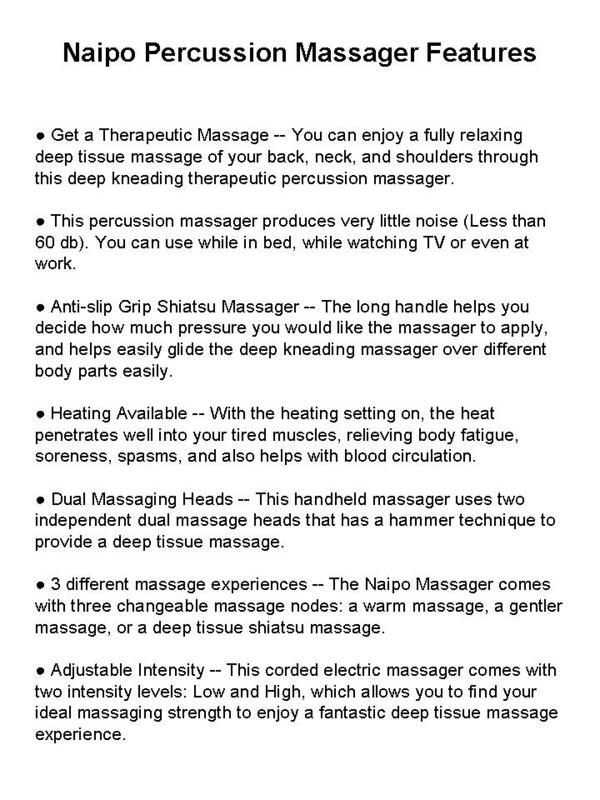 Naipo Percussion Massager provide a deep tissue shiatsu massage. The percussion massager can be used by yourself or with a partner. Just plug it in, turn it on and move it over the parts of your body that needs a massage. We had one very much like this Naipo Handheld Double Head Percussion massager, from Home Medics, we liked very much. It is no longer made by them. But this one is almost identical, only even lighter, and also comes with hard rubber balls that dig deep into large muscles to increase circulation and relieve pulled muscles, which are inflamed, The handle allows you to reach all areas of your back. Excellent massager! 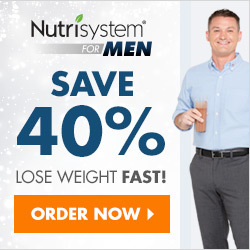 This product allows you the flexibility to reach those hard to reach areas. I was concerned that the pressure would not be aggressive. Not with this, you have the ability to deep tissue massage or light pressure. A must have. Excellent product. Well made and sturdy but light weight. This product was packaged very well and arrived in excellent condition. And my wife loves it. It is very light weight, the lightest she has ever used. The controls are very simple and are easily accessible. 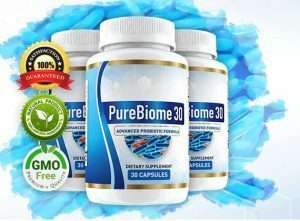 And it works fantastically at helping to get rid of those daily aches and pains. My husband is having back pain problems. its more like chronic, due to heavy lifting. and I have to do massage with hot oil every week. Until last week, one of my friend told me about this handheld massages devices. Without any hesitation, I bought it hopefully it help me and my husband also. Surprisingly, it works really well. Not as good as my Homedics version but it does the job for a fraction of the price. I use it to relax the suboccipital muscles at the base of my skull. The percussion oscillation works well but I do wish the heads were closer together. The long handle makes it easy to reach certain spots. The large head provides for the pressure needed to get that deep massage. Excellent strong percussive massager for back, psoas muscle, and other muscles & ligaments. Quite heavy, so not appropriate for travel. Very high quality. I have occipital neuralgia and this helps with the pain. Where Can You Buy the Naipo Percussion Massager? 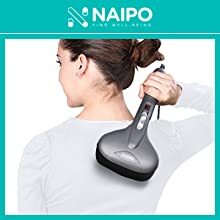 You can find the full line of Naipo Massage Tools at Amazon.com.